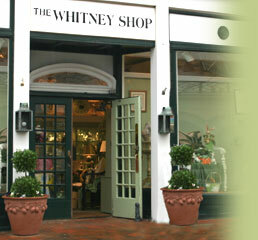 The Whitney Shop is proud to announce our new website! Our online Bridal Registry is ready to serve all of our registered brides, family and friends. Click the Registry button above to access the registry. We are committed to continuing our tradition of extraordinary personal service which we began in 1947. We remain a dedicated 2nd generation family store and plan to share our diverse selections to people near and far through the development of our ever expanding website. Please visit our store, we are conveniently located at 100 Elm Street in the heart of New Canaan Connecticut.